Do you feel like you lack imagination? 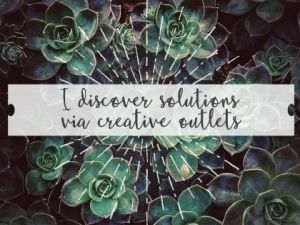 Do you struggle to create or to find solutions to the challenges in your life? It’s possible you’re suffering from a few creativity-blocking obstacles. By identifying the obstacles in your path, you can find ways to work around them. 1. A Cluttered Mind Makes Creativity A Challenge. Have you ever noticed that your best ideas come when you’re alone? You’re either being quiet or doing something very routine, like driving on a low-traffic road or taking a walk. It’s hard to get the creative juices flowing when you have too much going on. 2. You Don’t Prime Your Creative Mechanism. Try doing a different creative activity for a few minutes. If you’re trying to write a book, try creating and humming a new song for a few minutes. Legos, Lincoln Logs, tinker toys, modeling clay, crayons and brain teasers are other options. 3. Stress. You might have time to yourself, but still be too distracted to be creative. When your adrenaline is flowing, and you’re dealing with the stresses of life, creativity can be hard to find. 4. A Narrow Focus Can Limit Your Ability To Find New Solutions. Keep an open mind and consider all the possibilities. Avoid assuming you know where the general location of the answer to your challenge is. The best solution might be something you’ve never considered. 5. You Don’t Believe You Are A Creative Person. You’ve used your creativity countless times in the past. From dealing with an unpleasant boss to keeping a moody child occupied. Believe you’re a creative person and you’ll prove yourself correct. 6. You Never Get Started. Creative endeavors can be intimidating. Procrastination is one of the primary enemies to creativity. Set aside time each day to be creative, even if you’re convinced you’re wasting your time. You never know when your creative genius will strike. 7. Fear Of Failure. The possibility of failure can stop anyone in their tracks. Think of all the times you failed in the past and came through unscathed. Creativity feels risky, but it’s all in your head. 8. You’re Stuck In A Rut. It’s not easy to come up with ideas in the same old space. Get outdoors or at least move yourself into a space you don’t normally use, like a spare bedroom or a conference room. 9. You Insist On Doing It Alone. Fresh minds bring fresh ideas. Ask others for their input. You’re likely to find that the ideas of others trigger your own new ideas. Get some help! Who is the most creative person you know? They should be your first call. 10. You Don’t Have Enough Experience. You may have been a very creative child, but if you’re not flexing your creative muscles on a regular basis, you might be out of practice. Spend a few minutes being creative each day and you’ll enhance your creative skills. Creativity is a powerful skill and ability to possess. The most creative people in the world have a huge advantage over the rest of us. If you’re struggling to be creative, it’s likely that an obstacle or two is standing in your way. Overcome your obstacles and use your creativity to your advantage. Do You Allow Your Aversions to Control You?